This chart shows the 31 pre-Ptolemaic dynasties by the length of their rule (in 25-year bins). [example 1] Each dynasty is a coloured box. The early dynasties and the three Kingdoms are blue, with darker colours meaning older. Intermediate periods are red, orange, and yellow. Note that multiple dynasties could reign from different cities simultaneously in intermediate periods and at the end of the Middle Kingdom. 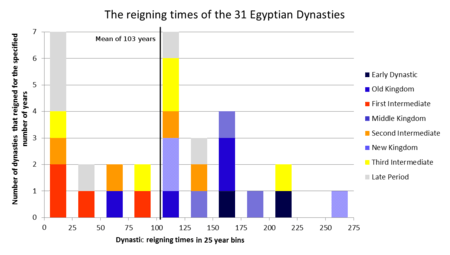 Further, dynastic reigning times are often very approximate; this chart uses the years of the Egyptian dynasty list template. In Ancient Egyptian history, dynasties are series of rulers sharing a common origin who are usually of the same family. Ancient Egypt's historical period is traditionally divided into thirty-one pharaonic dynasties. These divisions are due to the 3rd century BC Egyptian priest Manetho, and first appeared in his work Aegyptiaca, which was perhaps written for the Greek-speaking Ptolemaic Egyptian ruler of the time. The thirty-first dynasty's name is not due to Manetho and is a later coining. 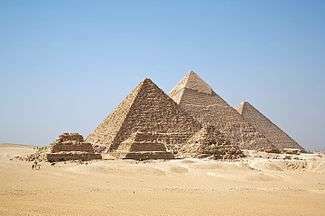 This page lists articles on dynasties of Ancient Egypt. The cities in which power was held during these dynasties follow their names, in parentheses.